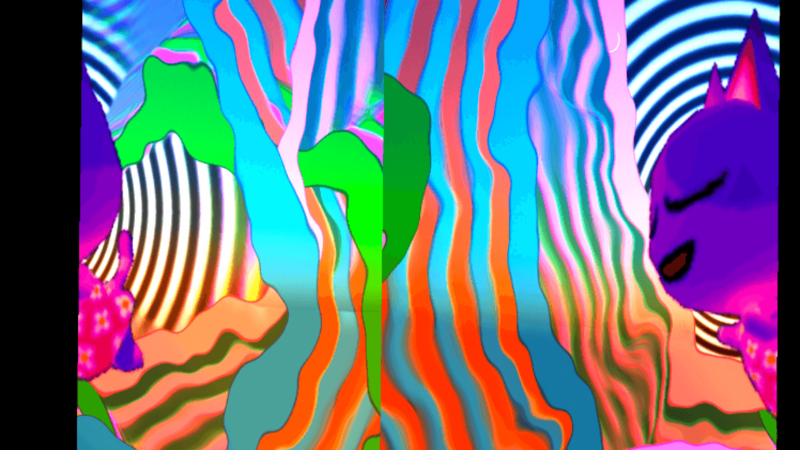 I had a lot of fun doing improvised visuals for that.party on wednesday in San Francisco. Official pics soon. Thanks to the good folks at Razer for lending us some very nice computers and ID@XBOX for sponsoring. It looks like Juegos Rancheros will be adding this to our list of annual events from now on, so I’m looking forward to next year’s party. @dee.dandelions "that.party: that time the dj poured organic soy milk into a vase with a white lily for the #aesthetic and then chugged it on stage"
Public Works had an unusual setup- three projectors that were all mirroring from the same source, but skewed and slightly overlapping, probably for their own vj’s video mapping. I had to quickly think of a way to make them all feel unified using my own rig- so I mapped my canvas to prevent the projectors from overlapping, and then offset my image so that my canvas looked like this: I then put a slow horizontal framehold movement on it, so that even though it was just the same image repeating three times, it looked like they all flowed together like one moving panorama, especially when I had an eye catching image like bob the cat floating by. I was kind of ill prepared when I got to the club, but being quick on my feet with vdmx actually let me make something on site that worked rather than having to rework a bunch of stuff I might have made beforehand without knowing what I was getting into.